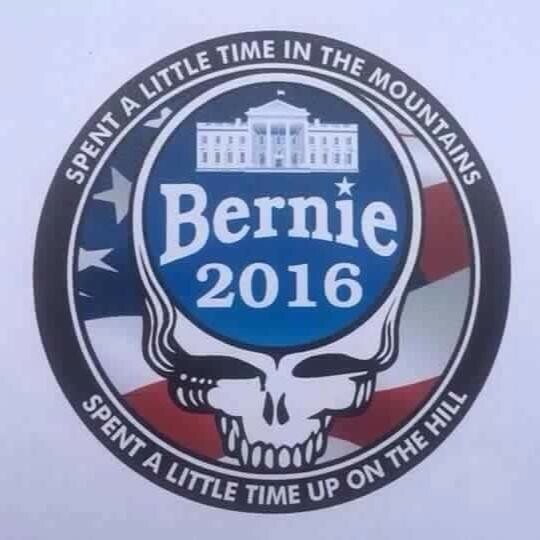 Sunshine Daydream: What Would Bernie Sanders Say to Deadheads? As I travel around and around this great nation of ours, I’ve met too many Americans going down the road feelin’ bad. Whether it’s here in Chicago or down in New Orleans, they don't need a Washington politician to tell them that the American middle class is going to hell in a bucket. Oh, baby, it ain’t no lie: This country faces more serious problems today than at any time since the Great Depression. The Wall Street billionaire class has become a friend of the devil and turned our great nation, this American beauty, into a brokedown palace. Today, we have more income and wealth inequality than any other major country on Earth, where the gap between the very rich and everyone else is wider than at any time since the 1920s. A handful of billionaires, their super PACs and their lobbyists have flooded our democracy with a black muddy river of corporate campaign donations. Meanwhile, the rich man in his summer home is singing, “Just leave well enough alone.” But his pants are down, his cover’s blown. For far too long, Republicans in Congress have been driving that train high on cocaine, while working-class Americans see trouble ahead and trouble behind. Just look out of any window, any morning, any evening, any day: We have 45 million people living in poverty, many of whom are working at low-wage jobs. The rent is in arrears, the dog has not been fed in years — and it’s even worse than it appears. One family owns more wealth than the bottom 130 million Americans. They’ll steal your face right off your head! This grotesque level of inequality is immoral. It is bad economics. It is unsustainable. And it’s all over now, baby blue! My fellow Deadheads, I’ve been all around this world and I can tell you, the United States remains the only major country on Earth that does not guarantee health care for all as a right. Turn on channel six, the president comes on the news, says, “I get no satisfaction, that’s why I sing the blues.” Yet despite the modest gains of the Affordable Care Act, 35 million Americans continue to lack health insurance and many more are under-insured. We continue paying far more per capita for health care than any other nation. We used to play for silver, now we play for life! But there ain’t a winner in that game. Don’t you let that deal go down! The minimum wage is a starvation wage; the pay’s pathetic, it’s a shame those boys in Congress couldn’t be more copacetic. America needs a living wage, which means raising it to $15 an hour over the next few years. This is exactly what Los Angeles recently did. I second that emotion. But help is on the way — and it begins by breaking up the largest financial institutions in the country. One way or another, we cannot allow Wall Street to continue to be an island unto itself, gambling trillions in risky financial instruments while expecting the public to bail it out. I’ve been gambling hereabouts for 10 good solid years. If I told you all that went down, it would burn off both of your ears. If a bank is too big to fail, it is too big to exist. If I had my way, I would tear this old building down! My fellow Deadheads, the eyes of the world are upon us as we face a planetary crisis of climate change coming at us like 100,000 tons of steel out of control. The debate is over. The scientific community has spoken in a virtually unanimous voice: This space is getting hot. You know this space is getting hot! It is caused by human activity and it is already causing devastating problems in the United States and around the world. Yet my Republican colleagues in Congress would have you believe that dear Mr. Fantasy can play us a tune and do anything to take us out of this gloom: sing a song, play guitar, make us happy. We’re almost ablaze, still they don’t feel that heat! As everybody knows, we live in a difficult and dangerous world — a peaceful place, or so it looks from space. A closer look reveals the human race. As president, I will defend this nation, but I will do so responsibly. As a member of Congress, I voted against the war in Iraq, and that was the right vote. I am vigorously opposed to an endless war in the Middle East. The whole world is full of petty wars. Commissars and pin-striped bosses roll the dice, but any way they fall, guess who gets to pay the price? My prescription: Feed the poor, starve the war! Now, I know that many of you are having a hard time living the good life. Maybe you’re tired and broken. Your tongue is twisted with words half spoken and thoughts unclear. You’re wondering, “What do you want me to do, to do for you to see you through?” But when things go wrong, wrong with you, it hurts me, too. Let me be very clear: This campaign is not about Bernie Sanders. It is not about the other one — Hillary Clinton — or Jeb Bush or any other big boss man. It is about you. It’s no secret that there is massive discontent with politics in America today. In the mid-term election in November, 63 percent of Americans did not vote, including 80 percent of young people. Wake up, little Susie! It doesn’t matter what you wear just as long as you are there! Gimme some lovin’! The race is on and I am asking for your support to be the next president of the United States of America! Now, I know that, for many of you, I feel like a stranger. I have more than a touch of gray on my head and, since 1991, I’ve been tangled up in blue-state politics in Washington, D.C. But don’t tell me this town ain’t got no heart, because I have spent my life seeking all that’s still unsung. My temperature is rising, got my feet on the floor. Crazy people rocking 'cause they want to go more. Tonight we’re gonna pitch a ball down to that union hall, gonna romp and tromp ’til midnight! Brothers and sisters, let my inspiration flow! There comes a time when push comes to shove, when we must all stand together and say loudly and clearly: We will survive! We will get by! I believe this great nation and its government belong to all of the people. Under a Sanders administration, the American working class cannot and will not fade away! So wave that flag, wave it wide and high, because here comes sunshine!